Grade 1 winner Liaison has been retired from racing and will stand the 2014 breeding season at B. Wayne Hughes' Spendthrift Farm in Lexington, KY for a fee of $10,000 stands & nurses. Campaigned by trainer Bob Baffert and owners Arnold & Ellen Zetcher, the 4-year-old Indian Charlie colt is a multiple graded stakes winner who earned his biggest career victory in the $750,000 CashCall Futurity (G1) at Hollywood Park as a two-year-old. Earlier at two, Liaison broke his maiden at Santa Anita and won the Real Quiet S. at Hollywood, before closing his juvenile campaign out with a three-race win streak that culminated in the CashCall. Liaison was ranked in the top five of weighted two-year-olds in North America on the 2011 Experimental Free Handicap at 120 pounds. At three, Liaison raced exclusively in top graded stakes, placing in races like the Jim Dandy S. (G2), Swaps S. (G2), and Affirmed S. (G3). 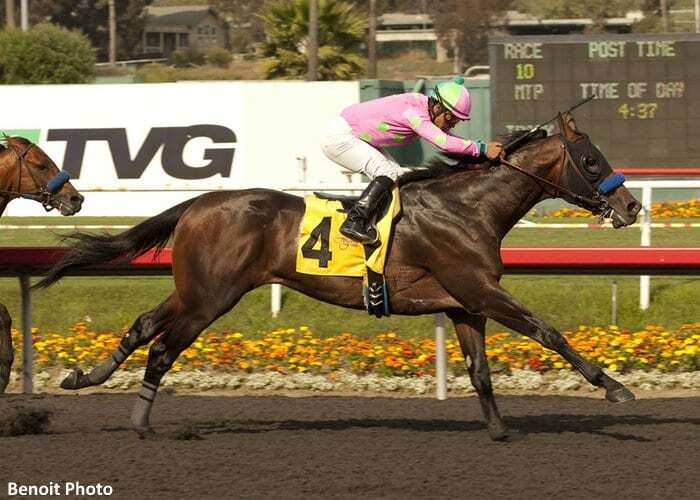 In 2013, he captured the Santana Mile S. at Santa Anita in his seasonal debut in March before winning the Mervyn LeRoy H. (G2) at Hollywood in May over Kettle Corn, netting a career-high 107 Beyer. An earner of $767,288 lifetime, Liaison joins Uncle Mo as the only Grade 1-winning juveniles at stud by the late Indian Charlie. He's out of the multiple stakes-winning mare Galloping Gal. For more information about Liaison, or to set up a private inspection, please contact Ken Wilkins, Des Dempsey, or Mark Toothaker at 859-294-0030, or visit www.SpendthriftFarm.com. This entry was posted in Bloodstock and tagged arnold zetcher, b. wayne hughes, Bob Baffert, des dempsey, ken wilkins, liaison, Mark Toothaker, ned toffey, spendthrift farm, thoroughbred stallions by Press Release. Bookmark the permalink.